There is a reason why I haven't tied flies... Ok, there are many reasons! But, I have run out of excuses. And I am so tired of paying $2.50 for every midge that I lose. 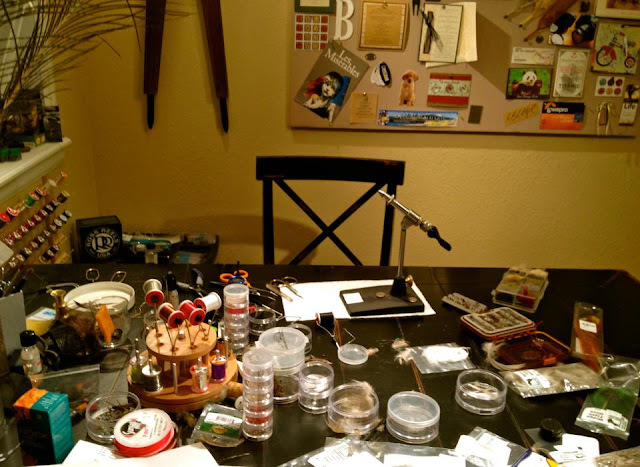 So, I am now signed up for a fly tying class in March. 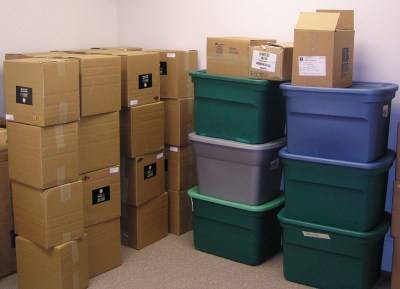 And I have now organized and packed items out of a room downstairs and moved them into another storage room. So... A whole room for "anything fly fishing". Gear storage to tyin' table and vise and all that good stuff. My fingernails even will be shortened. But, not all the way. = ) Unless I have to. Will it be worth all the preparation? We will see. 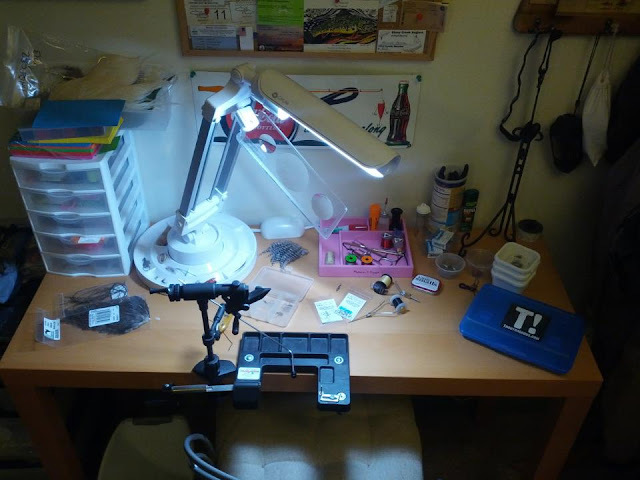 But, first I needed some ideas on how to set up a fly tying play work station. So, I went around to some friends and asked them if I could post up a picture of their home work benches. Now, I have a better idea of what I need and how I'm going to organize the room. Batter up!! Well, you know who's work bench this is... Well, wait a sec. It could be anybody's! Don't we all have a T! sticker lamenated on something fishy? Yes, this is Troutrageous Mike Agneta's tying area... Nice little setup for his Tenkara flies. The lamp is way cool. Whoa! Now wait a minute here... Can I order one of these gizmos? 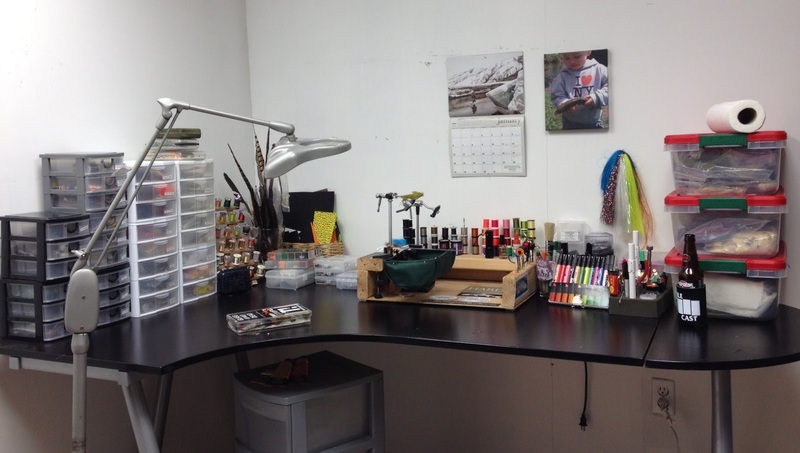 No, unfortunately, it is a fly tying table that Matt David over at FuncFish built himself! It's got most everything right within reach... Even a toothbrush! This is Howard's Corner. You know that guy over at Windknots and Tangled Lines. 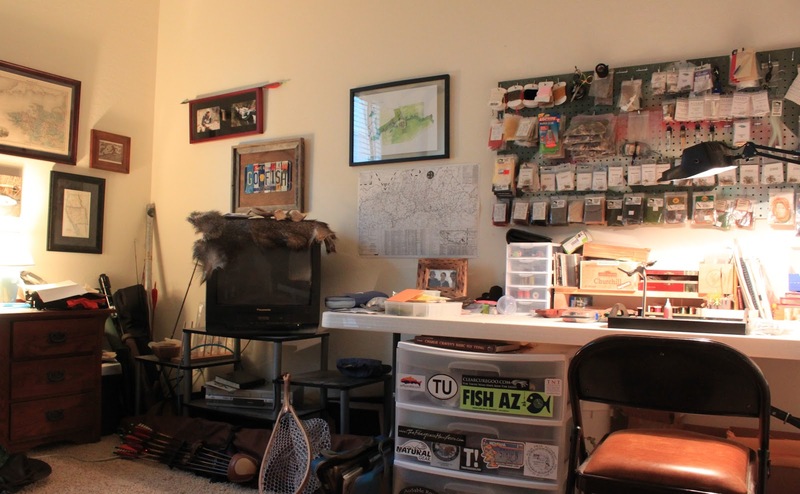 He has quite the fishy room with tying materials, books (Did you know that he likes to read? 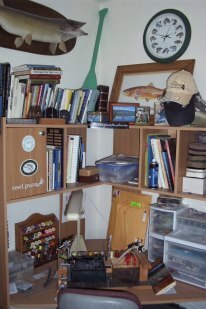 ), fish on the walls, and even a fish clock!! Nice. Can I order one of those? Now, Ben Smith over at AZ Wanderings, bring us a pegboard with all the goodies attached. Geez, it looks like a fly shop wall!! I personally like the fur lined TV set. = ) Kind of gives it an outdoorsy feel, don't you think? and Flies... I will take the bulletin board idea to heart. Then, I can put up "my favorite things". 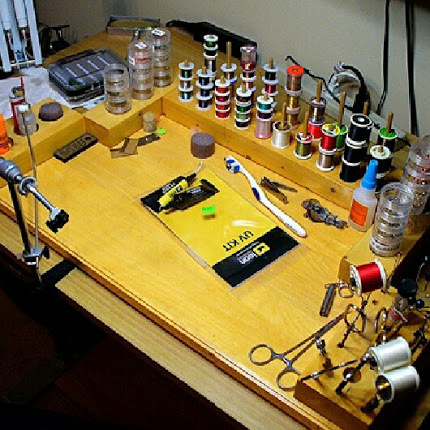 By the looks of this set up, he just might enjoy tying as much as fishing! Ok...this is getting serious. Grant Bench at OversmartingFish, has a comfy cabin setting along with...yes, a twin bed. What does this say about fly tying? Eh? No, he swears that it is rarely used. Really... = ) And the chair looks pretty comfy for late night tying sessions. I think that I will take one of those! There you have it... The many different looks of fly tying caves and all that extra stuff that goes in them. I'm sure that I will be taking an idea or two out of each of these photos. I used to be a big time craft lady... It's been years though since I sat down long enough to make something crafty with my own two hands. Maybe that is why I have delayed learning to tie flies. Because I know that it will become something that I like to do and I will spend too much time in the Damsel cave! Well, here goes nothing. The next phase of my fly fishing journey will begin in a couple of weeks. The class. Looking forward to following your journey. Have fun! Once you get into it you will never get out. I would bet that I have spent more money on tying supplies then if I had just bought the flies but don't tell my wife. I told her I would save money by tying my own. Joel ~ Is that supposed to scare me off? HA. Yeah, I know that I won't be saving any money here, but it's been almost four years of flyin', so now it's time to be tyin'!!! Hi Emily. Once you get started, your tying area will take on it's own look. You'll find that you put things where they are the most accessible for you. The only other step you'll need to make is a second on your house to by all the gear and material. LOL. Mark ~ I'm afraid of my "own look"!! I think that is why I have backed off on this for so long... But, as in everything in life, you will only succeed if you try. Not trying is failure for sure! You're stream of consciousness will never be the same, best of wishes. Go slow at the beginning and trust your own judgement with vise, and setup. I'm an example of overbuying materials at first, and switching vises several times in the beginning, but however you get there isn't important. Enjoy the journey, and keep the nails as long as you like. You'll learn how to adjust. I just found a tying setup that I'm really in love with, and it only took me a couple years to get there. Take a peek at the Casa as I just posted something about it last week. have fun, as I'm sure you will. Marc ~ Slow Poke is my middle name! No worries there. = ) I did read your post and I wanted to ask you if I could share your picture, but not enough time last night. I might head to some garage or estate sales and see if my dream desk is out there. Circle the first weekend in Oct. for the Frenzy! Tentative date right now. I'm looking forward to seeing what the Damsel's tying room is going to look like. Probably neatly trimmed and and full of cookies? Howard ~ Truth be told, my cookie exchange has been going fairly well. As long as they aren't near me. I have a personal goal that is going to be kept! And longer than a month! Haha. 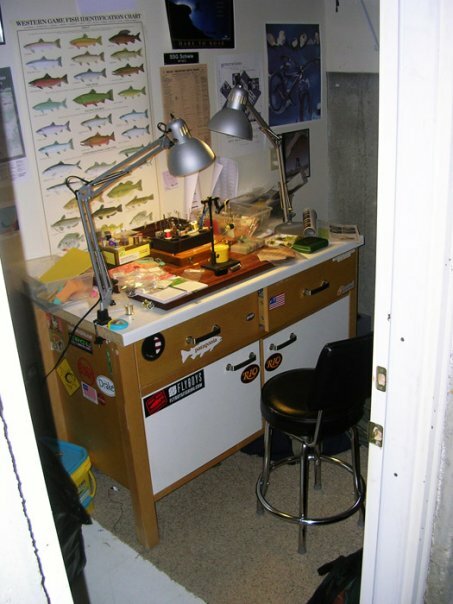 No, my tying room will only consist of everything fishy. good luck! I started tying not to long ago too. Can't wait to see what creations you come up with!! Well..... It's about time. You're gonna love it! Oh, Rod ~ What have I gotten myself into this time??? Here is the honest truth. Every time I go over to your site, I am mesmerized by the bugs you tie. I'm a midge girl at heart. I probably use some type of midge pattern 70% of the time. If I can tie up enough to keep me out of the fly shop every week, it's a good move... So, let's get tyin'! Mel ~ I sense some hesitation in your voice... No worries! I will NOT let tying cut back my fishing time! Thanks for the tips and you know what they say... If you can't beat em', join em'! First off congrats for taking the jump into threads and feathers. Second I must say those are the very neatest tying areas I've seen. Alan ~ I will leave the feathers alone for the time being! And yes, no one shared anything too messy, did they? Lol. Just remember, whoever told you fly tying would save you money is FULL OF IT. The sad part is, my tying space has grown by about 20% since that pic was taken. I have 100 spool racks mounted on the wall now, and there's about 3 or 4 more plastic tubs of stuff. Good luck and I look forward to seeing it. Mike ~ Where I will save money is on the tiny stuff. Midges, baetis... that kind of thing. I won't be ready for awhile to get into the hackle and feathers anyway. Your corner looks amazing and I will look for that trimming basket! Bill ~ I would like to say that I have more time in the winter...but, I don't! I am actually fishing the same amount all year round. So, I will have to just find one night every other week to sit down and tie. Yes, the lack of free time will be something that I will have to adjust a bit. And good for you with your stint with blogging. Going strong! Emily ... Drifting your own flies past a feeding trout brings this sport to a whole new level. Glad to see you moving in this direction! Mark - I'm hoping that will be the case. I know that this will increase my knowledge of what is around me when I step into the river and walk the banks. It shoukd be exciting! Just hope that I can tie those little ones! Which means that the bench is covered with stickers now and it isn't as tidy as it once was..
You just wait until you catch a trout on a fly you've tied! Brian ~ It will be a miracle if a trout will take my lopsided, fat midge pupae... but, hey... it's worth a try! Catching up on last week's posts now. Good luck on the jump into tying. It's good to know you can always whip something together if your box is on the empty side. It's something I think you'll like. Looking forward to the first RD-sponsored fly swap. Thanks, Mike! I appreciate your support in this feathered endeavor. Yeah, I think that it will be awhile before any of my flies are worth swapping! Lol. You will love fly tying. I just began with fly tying classes in January and am tying and watching videos and asking questions from all others that tie as there are so many tips out there and even better people will let you in on who has the best prices for things which does help......one being that joann fabric stores are hit up by many that are into tying. I was able to find a old cedar door and trimmed it up and made my own fly table from it and building it out has been a blast.Looking forward to seeing your work!